A Rajasthan High Court Bench comprising of the Acting Chief Justice Sunil Ambwani and Justice Prakash Gupta has issued an interim stay on the age limit prescribed for the Common Law Admission Test. “We are of the view that it is a fit case, in which we should grant interim order, directing the Organizing University namely, Dr. Ram Manohar Lohiya National Law University, c-Core Committee of Common Law Admission Test, Lucknow, not to reject the applications of the students/applicants to the Common Law Admission Test, 2015, on the ground that they have crossed the age of 20 years, in case of general category candidates, and 22 years in case of SC/ST and persons with disabilities. Their applications will not be rejected, and that the software for applying online, will be suitably modified, not to block the acceptance of the applications of such students,” the Court observed. The Organizing Universities have been prescribed by the Court to collectively consider and take an informed decision, in advising the Organizing University in respect of the maximum age to avoid multiplicity of proceedings. Further, the Director of RMNLU, Lucknow was directed to display the interim order on their website. The Respondents had averred that the prescription of maximum age of 20 years for general category candidates, and 22 years in the case of SC/ST and persons with disabilities, has an avowed object to be achieved. “A student ordinarily passes 10+2 examination at the age of 17. With three chances permitted in CLAT, he/she gets sufficient opportunity to appear in the CLAT up to the age of 20 years,” the Respondents stated. The Petitioners on the other hand submitted before the Court that a large number of students living in rural and semi urban areas, with various disadvantages suffered by them, as well as hardships to any one or more students due to any particular reason or causes, such as illness, may, by the time, he/she pass 10+2 Examination, crosses the age of 20 years. The Writ Petition, filed by Kshitij Sharma and Abhishek Rao challenges the age eligibility criteria of 20 years for taking admission into undergraduate program in the Common Law Admission Test(CLAT) being ultravires to the Rules of Legal Education, 2008, framed by Bar Council of India under the powers conferred to them b y the Advocates Act, 1961. The clause 28 of Schedule III of Rules of Legal Education, 2008 prescribed the age limit for admission into under graduate and post graduate programmes. This clause was withdrawn by the Bar Council of India vide Notification dated 28.09.2013. The said notification specifically mentions that in view of the various decisions by the different High Courts, the prescription of age limit of 20 years for vide Rule 11 is unconstitutional and against the principles of natural justice. The Petition also brings to the Court’s notice that High Courts of different jurisdictions are allowing those candidates who are filing writ petitions before them to file a physical copy of application to the CLAT organizing committee. “As a result of which only those aspirants, having knowledge and access to the courts, are able to fill this application form. Hence, despite of having a chance of being eligible for CLAT, they are not being allowed to sit for CLAT because of the lack of knowledge and resources. This has resulted in a whole new class of aspirants whose rights are being violated,” it adds. The Petitioners, both first year students of NLSIU, Bangalore, have prayed for removing the age restriction for appearing in CLAT 2015 for admission into undergraduate programmes. 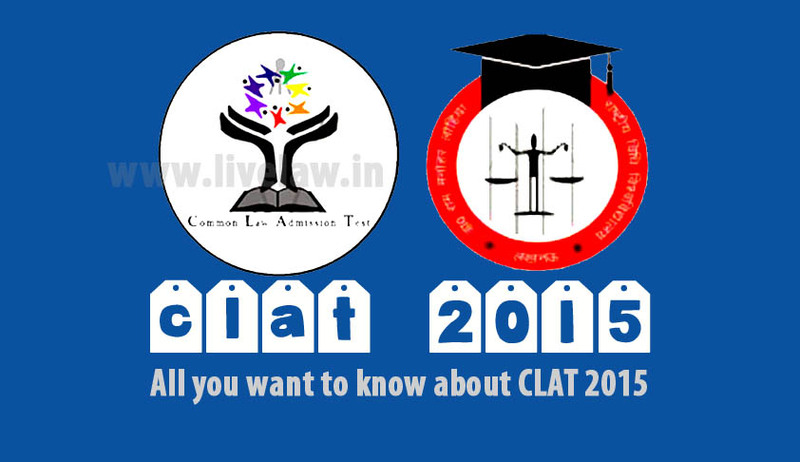 The Common Law Admission Test (CLAT) for the year 2015 will be conducted by Dr. Ram Manohar Lohiya National Law University, Lucknow (RMLNLU) on the basis of the Memorandum of Understanding dated on 10t h May, 2015. Read the interim order here.